To compliment our lovely dresses and outfits, we offer children's, baby, girl, and boy blouses, white blouses for babies, baby, girl, and boy turtlenecks, ruffle lettuce edge turtlenecks, children's, girl and boy smocked shirts, and girl boy monogrammed shirts. Our children's blouses and shirts can be worn under dresses and John Johns or longalls, and smocked and monogrammed blouses and shirts can be worn alone OR with our girl ruffle shorts, ruffle capris, ruffle pants and boy's shorts or pants. We offer children's, baby, girl, and boy blouses in white and ecru in short sleeve or long sleeve and turtlenecks with various color trims by Rosalina, Funtasia, Zuccini, Vive La Fete, Silly Goose and more. Our blouses can be worn as made or even monogrammed for extra flare. 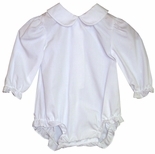 Our smocked shirts are available in either short sleeve or long sleeve and have adorable embroidery in the smocking such as cars, trucks, tulips, fairies, ballet dancers, holiday scenes, fire engines and more cute designs. Our smocked shirts for girls and boys are made by Vive La Fete, Silly Goose and Anavini.